I have just moved from a 2014 911 Turbo into a 991.1 GT3 and am thrilled with the move. The Turbo is an exceptional car, so capable , so fast and entertaining when you start to push on, but I kept hankering after the GT3 after driving one a couple years ago. The GT3 is so alive, visceral and connected it completely makes me remember why I have said it is the best car I have driven. 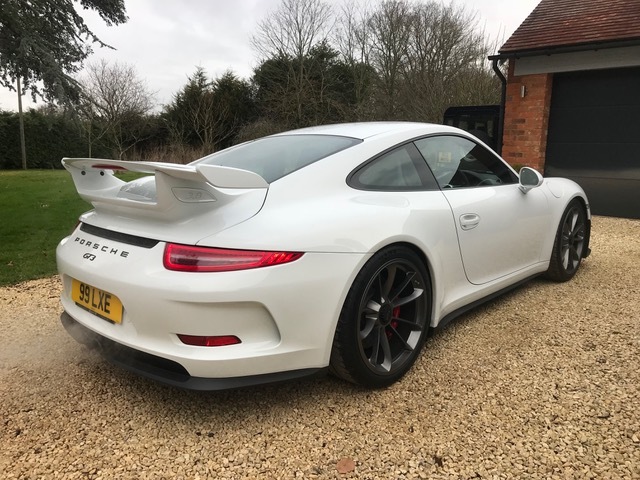 If anyone is entertaining the idea of a 991 GT3.....do it, you will have no regrets.........oh, and the noise at 9000rpm will keep you entertained for along time. .........oh, and the noise at 9000rpm will keep you entertained for along time. It'll keep the Porsche mechanics entertained too from what I've heard about those engines. Seriously though, I do fancy one. But I'd have to spend 130k to get required spec. And which ever way you cut it- that's overs. I won't do overs. I would have like PCCB but had to compromise somewhere, and even with that compromise it doesn’t reduce any of the enjoyment. Drive one and you will see what I mean. Wheels contrast really well with the white. If you don't mind me asking, but do you know if the engine is a E1, F or G-series variant? Am already thinking about subtle personalisation......silver Porsche stripe on the side and wheels to silver to show off the spokes more. Thanks, was just curious. Cast iron warranty on the engine to 10 years of age, so you can give it the beans with confidence. Oh I know exactly what you mean. Amazing cars. I did a PEC day in a GT3RS and it's haunted me ever since (in a good way). And as pointed out, Porsche have stepped in and whacked a 10 year warranty on the engines. Happy days. A beautiful car you've got yourself there mate, enjoy!